We totally dig it, man! 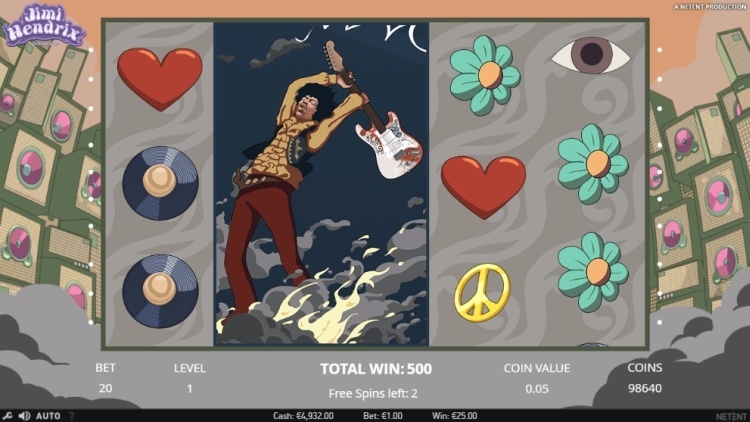 Get your bandana out, put on your bell-bottom jeans and start rocking – the long-awaited Jimi Hendrix slot is finally here! Jimi Hendrix is the second release of the Netent Rocks trilogy, after the Guns N Roses slot and before the Motorhead slot. We enjoyed the Guns N Roses slot a whole lot, so we were very curious to find out if the Jimi Hendrix slot is just as good, or maybe even better. Graphically, we love the Jimi Hendrix slot. Netent’s design team can be very proud of themselves for creating a slot that is colourful, has a great psychedelic sixties groove and still feels very modern, all at the same time. The symbols range from peace signs, Fender Guitars and flowers to great images from Jimi Hendrix, the ultimate guitar hero. A very nice touch is the way symbols in a winning combination are animated. Sometimes beautiful flowers grow along the edges, and sometimes the symbols just spin. It all looks great and makes the gameplay more exciting, without becoming tedious. Lots of Jimi’s greatest hits can be heard in the background including Purple Haze, Crosstown Traffic and Foxy Lady. The slot has 20 fixed win lines with a minimum bet size of $0.01 per line. The minimum bet per spin is $0.20, and the maximum bet is $200 per spin. The return to player percentage is a cool 96.9% which is amazingly high especially for a franchised slot. The maximum payout per spin is 80,000 coins. The highest paying symbols are the wild Jimi Hendrix symbol and the Red Guitar symbol which both pay out 400x the line bet. It is possible to get a full screen of Red Guitar symbols, but you need a little help from one of the slot’s extra features to make this happen. Get 4 or more Red Guitars in one initiating spin, and you will get one free respin while the Red Guitar symbols become sticky. As long as new Red Guitar symbols appear on the screen, this process is repeated until no more Red Guitar symbols appear on the screen during a respin. This feature can be very lucrative as well as very disappointing. If the Jimi Hendrix Purple Haze symbol lands on the first reel, all 10, J, Q, K and A symbols turn into wilds. This is the primary bonus feature of the Jimi Hendrix slot. It is triggered by three scattered Jimi Hendrix symbols on reels 3, 4 and 5. Jimi looks quite the cool cat in this symbol, by the way, sporting his rocking good looks and staple white left-handed Fender Stratocaster axe. The coin award: this one you want to avoid as it is not very exciting and does not pay out well – between 8x and 30x your total bet. These free spin features (and coin win feature) are quite hard to trigger but are both very entertaining and exciting. That is, minus the coin win feature, which is just plain bland. However, we understand why Netent put in one less desirable bonus feature in the loudspeaker room – there is also a sense of relief if you manage to win one of the free spins bonuses instead of that dreaded coin win feature. It all adds to the enjoyment of the Jimi Hendrix slot. 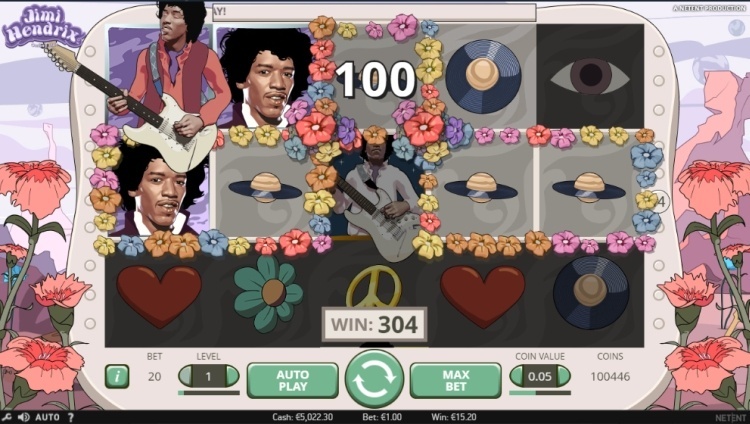 Watch this clip of the wonderful Jimi Hendrix slot to see the various bonuses and game features in action. Groovy! We love everything about this slot: the music, the vibe, the gorgeous graphics and the gameplay. The bonus features are fun and have some great potential. All we can say is: try it for yourself. If you are a child of the sixties, you will dig it, man. If you were born decades later, you would still love it. Another great release by Netent. 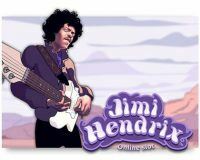 Play Jimi Hendrix at Slots Million with a 100% bonus up to $100 and 100 free spins.